Search for chats with specific tags or view popular tags to better understand your chat traffic. Note: The features below include chat tags, trigger tags, and API tags. For details, see Understanding different types of tags in Chat. You can search for past chats that contain specific tags using an advanced search option in History. If you export search results, tag information is included in the CSV file. Tags are indexed and searchable immediately after they're created. Click the arrow next to the drop-down field to view advanced search options. In the Tags field, enter one or more tags to show results with any of those tags. Note: When entering tags to search for, only chat tags will appear in the drop-down list of available tags. However, you can also search for trigger tags and API tags. 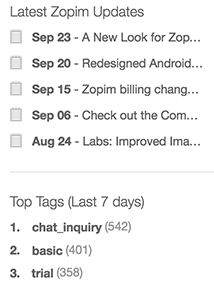 For details, see Understanding different types of tags in Zopim. Click on a conversation in the results to view the chat's tags, transcript, and other details. Review your account’s top tags on the Home page of the dashboard. Viewing the most consistently popular tags can help you identify common questions or points of confusion. Similarly, a sudden surge in a certain tag might alert you to a potential issue. The Top 10 tags looks at the last seven days, not including the current day, from 00:00 to 00:00 -7 days based on the account’s timezone. If you notice you've added tags but they're not appearing in your list of top tags, it could be because they are tags from the current day and they will only appear the next day. More detailed analytics options for tags are planned for a future release. The list shows the most frequently used tags, including chat, trigger, and API tags, over past seven days.The number of times a tag was used appears next to each tag in parentheses. Is there a way to pull the analytics for the top tags over a period of time versus just the last 7 days for top tags? 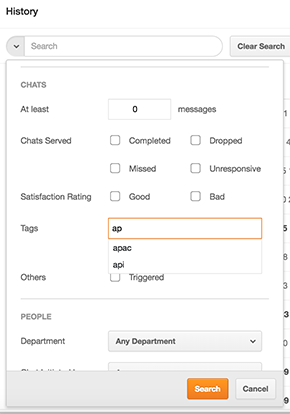 Currently, there is no native analytics for tags inside the Chat dashboard. If you are using Chat with Support and you are using automatic ticket creation, you can use Insights to build a report against the tags (that also gets sent to the ticket). Unfortunately, there are no plans in the 2018 roadmap to offer tag reporting within the standalone Chat experience. I was wondering is there a way to search chat history only by specific set of tags. I am not asking about typing various tags in search and result that is showing all chats containing at least one of those tags. For example I want to search chat by brand, platform and a department tag. I will get the results even for Android tag because it has Samsung as brand tag too. Is there a way around this? Thank you. Hello Miki! We discussed this in the request you submitted, but I'm posting this solution here, in case it helps future people who are trying the same thing! I hope this workaround helps!